The Rainy-Day Championship | "Jump Higher!" This past Cinco de Mayo weekend, Lucha Libre Volcánica had the pleasure of performing for two days in Seattle at the Mobile Food Rodeo’s Taco Libre Smackdown. If you missed the show, well… at least you were probably somewhere dry. The weather fluctuated between varying degrees of downpour for both days of the event. What does this mean for a troupe of luchadores, you might ask? Come rain or snow or sleet or hail… the show must go on! That being said, the ring very quickly became a large slip n’ slide. As you can see in these pictures by LLV’s friend and photographer Amanda Ovena as well as these ones from the Seattle Times, our shiny lycra was soaked before we even got to the ring. And on a more practical note, the ropes were treacherous and the mat was slicker than usual which put a limit on the amount of flying anyone could do. While we specialize in feats of daring do, there’s a clear line between daring and stupid. We had to slow matches down significantly, but the crowd was still captivated and absolutely nobody was injured either day. Now here’s the big news. Aside from this being the least dry event I’ve ever wrestled in, I also came home with the Taco Libre Smackdown championship belt! I was originally slated to go up against El Mensajero for the title, but due to unforeseen circumstances and a last-minute card change, I ended up facing off against Sonico. It was a tough match (not only because I was trying to keep my balance on wet vinyl the whole time), but after what seemed like a small eternity in the rain I managed a pin. I have to say, I felt like the true Washingtonian that I am holding up the belt *just* as the sun briefly peeked out from behind thick gray clouds. This is a big deal, not only for me personally, but for the Pacific NW as a whole. 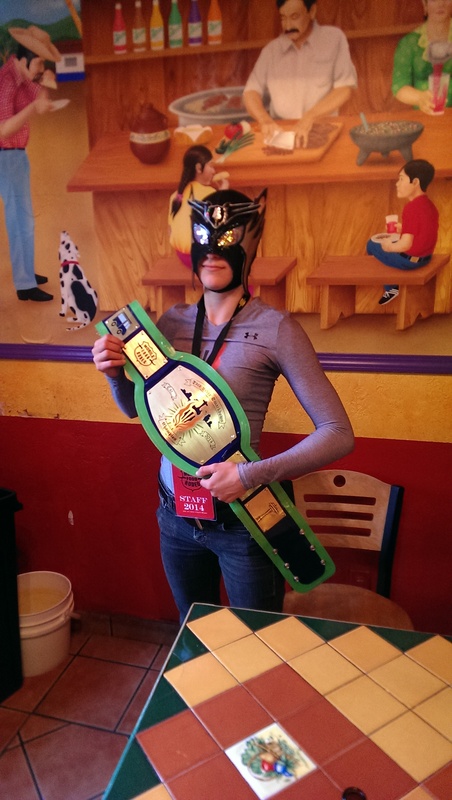 I am the first luchadora to win any championship in the region; the first woman to walk away with a belt. Now it is up to me to show everyone that I am worthy of that honor, and to defend my title at next year’s Taco Libre Smackdown. So… back to training. With a first championship under my belt (pun completely intended), I look on to bigger and better things. Who knows, maybe the LLV championship will be somewhere down the road? Granted, I’d have to go through Ave Rex (and who knows who else) to get there.